Those who are familiar with the picturesque Antelope Canyon (of Instagram fame) will find a similarly breathtaking sandstone slot in Waterholes Canyon. The east side (east of the US-89 bridge), can be explored by guided tour and resembles a less crowded, shorter, slightly less spectacular version of lower Antelope Canyon with a few short climbs and ladders. However, Waterholes West (west of the US-89 bridge) is the focus of this write-up. 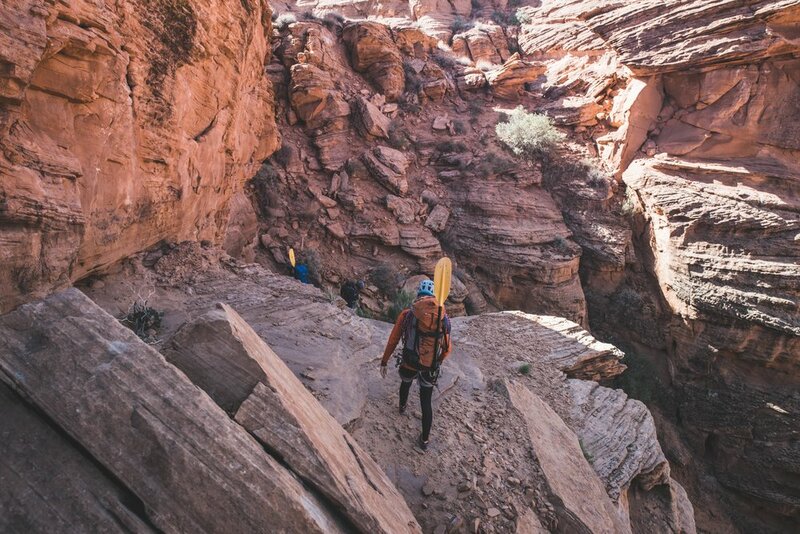 It’s an unparalleled opportunity to pair packrafting with canyoneering in classic southwestern sandstone slot canyon (say that ten times fast). 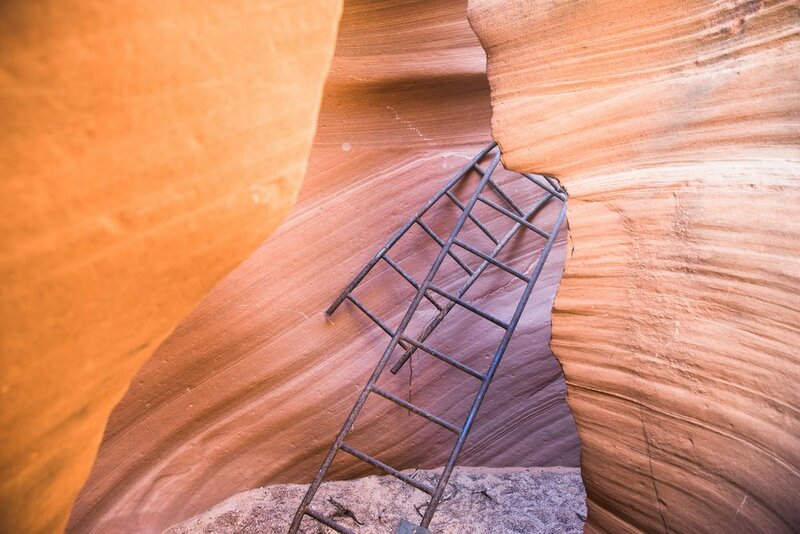 Waterholes West is a 4-mile long technical canyoneering route that descends through 1,500 feet of carved Navajo Sandstone to reach the Colorado River. Once at the river a serene 4-mile flat-water float through Glen Canyon National Recreation Area awaits. The struggle to obtain permits and the 1.5 hour round trip shuttle are well worth the experience of this desert classic. A word of caution: Waterholes Canyon is dynamic, it’s carved primarily by infrequent flash floods resulting from intense monsoonal rains or winter storms. These floods have the power to dramatically change the canyon over the course of several hours; adding new obstacles, scouring new potholes, ripping out anchors or ladders, and depositing debris tens of feet above the canyon floor. This trip description is based on two visits to Waterholes Canyon, one in October of 2015 and another in May of 2018. Significant changes to the canyon had occurred between those trips. It's best to be prepared for anything, and try to talk to people who have been to the canyon recently. At the time of this post, all rappels (except the first) had bolts with hangars or pitons, and many had chains. The first step is to leave a car at the Lee's Ferry boat ramp 36.865962, -111.587305. Then take another vehicle to the start. The approach is short and begins at a fenced-in parking lot about 5 miles south of Page, Arizona along the side of US-89 just south of Horseshoe Bend on the north side of a small bridge 36.837916, -111.508179. The parking fee is $10, and the gate to the parking area closes at 5:00 pm so be sure to let the parking lot attendants know if you plan on being later than that (you probably will be). The parking lot attendants will usually wait for you to return or provide a phone number you can call to let you out after you finish. Next, descend the well-trodden but scrambly trail south of the parking area to enter Waterholes Canyon just east of the highway bridge. Your first obstacle is the wreckage of an old mangled car sandwiched between the sandstone walls beneath the highway bridge use caution or at least make sure your Tetanus shots are up to date. Shortly after the car, you will reach the first rappel. Depending on how you count them, how long your rope is, and if the canyon has flashed lately, there are between 9 and 13 more rappels ahead of you. All of them should have bolted anchors. Many of the rappels are between 30 - 50 feet so having a short rope saves you the time of having to coil and uncoil a larger rope. There is a way to scramble out after rappel 4 or 5 if you feel like you will be short on time or run into another group ahead of you. The journey through waterholes consists of downclimbing, squeezing through very tight corridors, and perhaps a bit of swimming. There are often between 1 and 4 deep pools of icy debris-filled water. One ephemeral pool that sometimes appears before a sharp left turn in the canyon (maybe at the base of rappel 6) has the feel of the trash compactor room of the Death Star, enjoy. After the sharp left turn, the canyon begins to open up and the west side of the marble canyon rim can be seen in the distance. At this point there is a short rappel with a deep pool, people often tackle this obstacle by draw straws and send one unlucky swimmer to rig a zip line for the rest of the group. After this, one good sized rappel separates you from big 300+ foot rappel. The big rappel takes a while so make sure to get there with plenty of daylight. My recommendation is to break it into 4 rappels to avoid getting a rope stuck in the infamous rope-eating crack. Rappel into a very tight slot to reach a set of anchors, then another 15-foot rappel gets you to the top of the 300-foot wall. VERY IMPORTANT: Set up the next double-rope rappel by feeding the rope through the anchors and through the quickdraw so that when you pull the rope it doesn’t get caught in the crack. It’s also a good idea to dangle your pack beneath you rather than keep it on your back. At the bottom of this rappel, a short swing gets you to a small ledge with a set of anchors, one more double rope rappel gets you to the base of the big rappel. Just two more rappels get you to the river. Once at the river, inflate your Kokopelli packraft and start moving. This stretch of marble canyon has deep, clear, emerald green waters. The water comes from Lake Powell upstream and discharges from the bottom of Glen Canyon Dam so it is very cold, be prepared. Thousand foot walls of Navajo sandstone rise around you and in the late day sun, they turn a brilliant shade of orange. After about 2 miles there is a mule trail on the left side of the river you can use if you get too cold paddling, but you will still have to cross to the other side of the river before you reach Lee's Ferry. You know you are getting close when you see a large sloping sand deposit on river left reaching from the rim down to the river, Lee's Ferry is just around the next bend. Once you reach the ferry, grab the vehicle you left there in the morning and drive the 45 minutes to pick up your vehicle in the lot at the trailhead. Waterholes Canyon is about 5 miles south of Page, AZ on US 89 just south of the famous Horseshoe Bend. Waterholes Canyon is on land owned by the Navajo Nation, exploring Waterholes Canyon requires a permit from the Navajo Parks Department. Permits can be obtained at the LeChee Chapter House M-F 8:00 am - 4:30 pm (Navajo Nation observes daylight savings time) or the Navajo government office at 290 Cowboy Ray Road open on weekends. Permits cost $12 per person per day for the section of Waterholes Canyon west of US 89. East Waterholes Canyon (upper Waterholes) is a non-technical slot canyon which can be explored only by guided tour, which can be reserved the day of at Waterholes Canyon bridge on US 89. Parking your car at the Waterholes Canyon Trailhead costs $10. The floating portion of the adventure ends at Lees Ferry within Glen Canyon National Recreation Area, the day-use fee is $25 per vehicle, but federal interagency passes are accepted. Do not undertake Waterholes Canyon if there is any chance of rain in the area, this slot canyon flash floods, and judging by driftwood lodged some 20-feet above your head. It’s not a place you want to be in a flash flood. May-June is the driest time in Northern Arizona and ideal for this adventure. 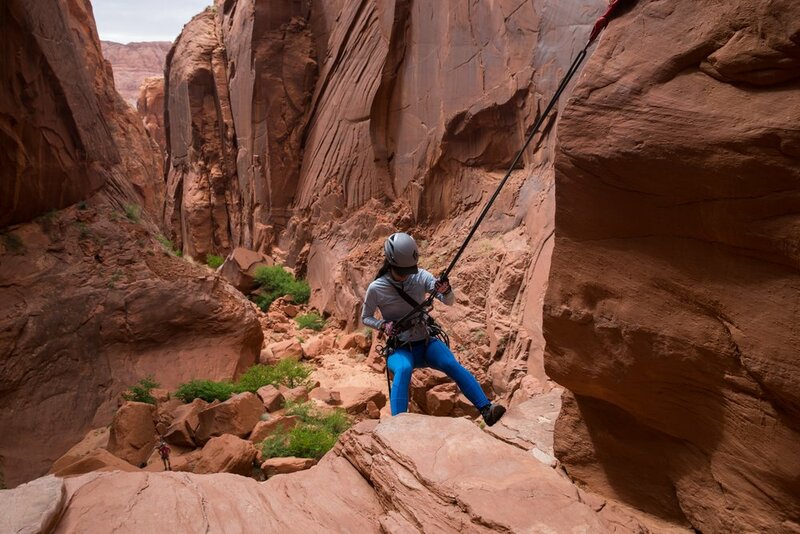 Waterholes Canyon is a serious canyoneering endeavor do not undertake this trip without proficiency rappelling and experience troubleshooting rope systems and anchors. Group sizes larger than 4 are not recommended unless you have enough gear to break up into smaller groups of 2-4. The largest rappel is over 300 feet (often broken into 2-3 rappels with semi-hanging anchors). This rappel has a rope-eating crack at the top which has been known to leave people stuck hundreds of feet in the air (not a bad idea to have an extra rope). It’s a good idea to call the Navajo and see if any other groups have secured permits for the day you intend to complete the descent. This trip has become more and more popular in recent years and it’s not recommended to descend water holes if you are behind another group. It's not uncommon to be stuck behind another group for several hours waiting on the big rappel. Start as early as possible, because floating the Colorado can take several hours if you have a headwind. Also, the water in the Colorado below Glen Canyon Dam is always cold, generally between 45- 50 degrees Fahrenheit, so floating after dark can be very cold. I recommend wrapping your Kokopelli packraft (or other floatation device) in a rope bag or rice bag to protect it from abrasion in the narrow slots. Unless it’s been very dry recently you can expect to find icy-cold standing water in the canyon, there are several watery holes in Waterholes Canyon as the name suggests. You may find keeper potholes at the base of some of the rappels. Dry Bags and experience getting out of keeper potholes is recommended. Waterholes Canyon is dynamic, infrequent flash floods scour this canyon and may rip out bolted anchors, change drops, and add new obstacles at any time, be prepared for the worst.